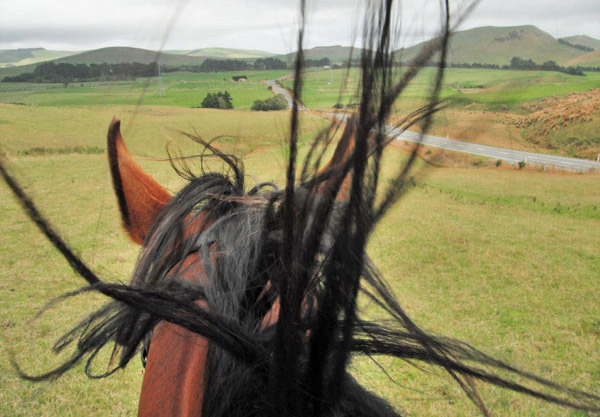 Hot and windy weather adds up to a bad hair day for recreational horses, research suggests. Researchers in Switzerland have developed a sensitive testing method involving horse hair to detect and quantify the past use of opioids, sedatives and non-steroidal anti-inflammatory drugs. The University of Zurich team, writing in BMC Veterinary Research, said the technique could be used for long-term retrospective drug monitoring. It could ultimately prove useful in anti-doping control programs, pre-purchase examinations, and veterinary checks for insurance purposes. Milena Madry and her colleagues noted that horse hair analysis had attracted increasing interest for the monitoring of veterinary drugs, hormones, nutrients, trace elements and contaminants. Hair, in contrast to blood and urine, provided a long-term historical record of drug exposure. Other advantages of hair analyses included the fact it was non-invasive, as well as drug-stability in hair and the easy shipping of samples. Growth of temporary coat hair changed with the seasons whereas the permanent mane and tail hair grew continuously with relatively constant rates reported in the range of 1.7 centimetres to 2.5cm a month. Samples of long hair could therefore be segmented to narrow down the corresponding times of drug exposure. They noted that detection in horse hair had been demonstrated previously for morphine, clenbuterol, anabolic steroids, antimicrobial agents, diazepam, cortisol, arsenic and selenium. The study team set out with two aims: to extend the use of mane and tail hair as a matrix for the monitoring of sedative, pain-killing and anti-inflammatory drugs frequently used in horses, and to compare closely the analytical findings in hair segments with the corresponding times of drug administration. To that end, they established a highly sensitive liquid chromatography-tandem mass spectrometry method that they applied to mane and tail hair samples from 10 horses with a known history of drug treatments which were analyzed in segments of 2, 4 or 6 centimetres. The hair segments were first decontaminated, cut into fragments and methanol-extracted under sonication – the application of sound energy to agitate particles in each sample. The extracts were tested using liquid chromatography tandem mass spectrometry for 13 commonly used drugs. They said their technique proved both sensitive and selective, providing validated detection of drugs in the hair. Analytes were detected in hair samples with a length of up to 70cm, the researchers reported. Fourteen out of 16 hair samples were positive for at least one of the tested drugs. Segmentation allowed for time-resolved monitoring of periods of 1 to 3 months of drug administration. Concentrations in dark hair reached a maximum of 4.0 picograms per milligram (pg/mg) for butorphanol, 6.0 pg/mg for tramadol, 1.4 pg/mg for morphine, 1.8 pg/mg for detomidine, 1.2 pg/mg for acepromazine, 39 pg/mg for flunixin, 5.0 pg/mg for firocoxib, and 3’600 pg/mg for phenylbutazone. Only trace amounts of meloxicam were detected. Drug detection correlated well with the reported period of medical treatment, they said, with the researchers working off a baseline of an average hair growth rate of 1.84cm a month. No analytes were detected in the light-colored mane and tail hair samples from one horse despite the animal having been given acepromazine and phenylbutazone previously. They noted that the incorporation of a systemically administered drug into hair was dependent on the melanin content and the physicochemical properties of each substance. In contrast, no differences in hair incorporation were observed for acidic compounds and, as a consequence, hair concentrations of ketoprofen, meloxicam or phenylbutazone were low independently of hair color. Basic drugs, they said, could reach 10-fold higher concentrations in pigmented than in non-pigmented hair. The detection of buprenorphine, butorphanol, detomidine, firocoxib, flunixin, ketoprofen, meloxicam, morphine and phenylbutazone fulfilled all validation criteria, they reported. For chlorpromazine and tramadol, the standard deviation was exceeded, but this was compensated by the inclusion of deuterated standards (in which the ordinary isotope of hydrogen has been replaced with deuterium). The study team outlined several considerations for the correct interpretation of hair findings, including the possibility that a negative finding may result from decomposition of the drug in the hair due to exposure to ultraviolet light or hair damage.